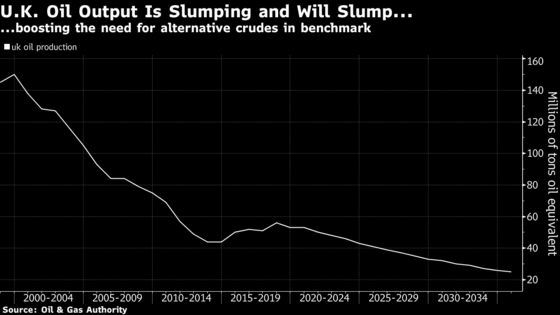 (Bloomberg) -- For a glimpse into what the global oil price might look like one day, a good place to look is the Dutch port of Rotterdam. Traders and analysts have long argued that the global oil industry’s main reference price, which is based on cargoes loaded in the North Sea, needs an overhaul to reflect weaker regional production. But there are no signs that Platts’ Dated Brent is about to cede its dominant position as a benchmark any time soon. Multiple oil-producing countries the world over link the price of their barrels to Platts’ assessment, while crude futures are ultimately tied to it as well. There’s little doubt the influence of American crude is growing in the region. 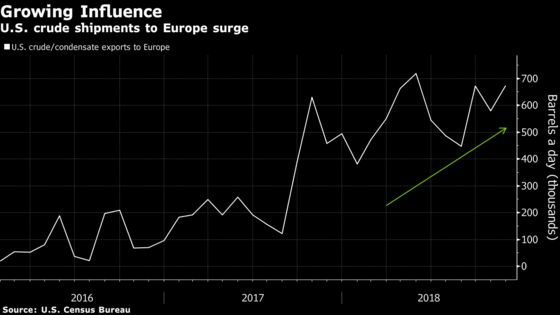 Shipments to Europe averaged 560,000 barrels a day last year, up from about 100,000 in 2016, according to U.S. Census Bureau data. The five North Sea grades that make up the Dated Brent benchmark produced 960,000 barrels a day on average in 2018. Some traders -- especially those with U.S. barrels -- previously said they would favor a global benchmark that incorporated both WTI and Brent. Others, mindful that the 660,000 barrel-a-day Johan Sverdrup field in the North Sea is due to produce its first oil later this year, oppose such a widening. European producers will have to face increased competition from the U.S. either way. Occidental Petroleum Corp., one of the largest drillers in the Permian, is already exporting 10 percent of its production, its CEO said last week. With U.S.’s production forecast at 12.3 million barrels a day this year, it will far eclipse supply from the likes of the U.K. and Norway. In another sign of how U.S. barrels are affecting how oil gets priced, Enterprise Products Partners LP will host its second U.S. crude export auction in April using a platform run by CME Group Inc. The first was held early this month, selling light sweet crude to Glencore Plc from Enterprise’s Houston oil terminal. The U.K. production sank from about 3 million barrels a day of oil in the late 1990s to 1.1 million last year, according to the U.K. Oil and Gas Authority. Norway pumped 1.5 million barrels a day last year, compared with 1.7 million in 2011. That dynamic will only make U.S. crude more important -- as a source of supply and as a way to determine prices.